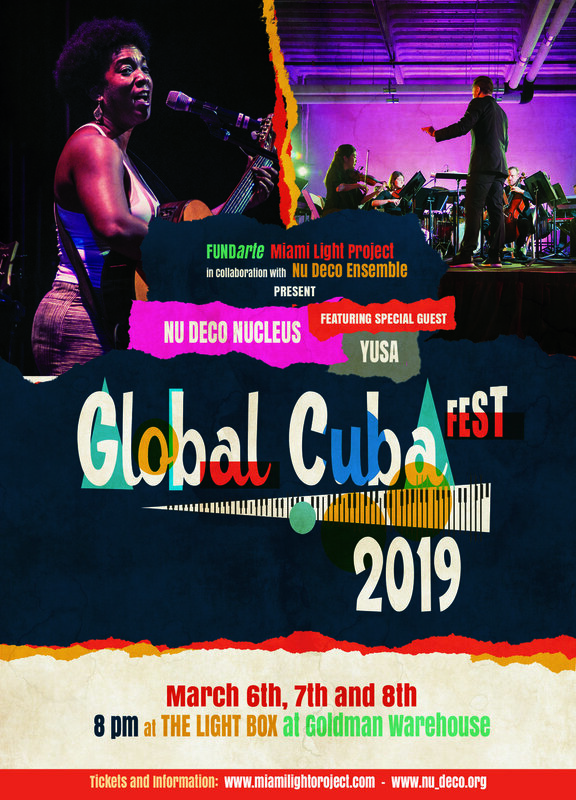 Presented in collaboration with FUNDarte and Miami Light Project, Nu Deco Nucleus will perform music from rising young Cuban composers, iconic masters, and unique collaborations with guest artists, world-renowned singer-songwriter Yusa and composer, pianist, and arranger Joachim Horsley. Born and raised in the Buena Vista area, now known as Playa, Yusa split her time between her love of music and her love of the sea. Influenced by her father, who was a sailor, Yusa started playing guitar at a young age, before moving on to piano and bass lessons. Throughout the '90s, Yusa performed in bars and nightclubs in Havana citing American musicians such as Miles Davis and Stevie Wonder, as well as British singers like Peter Gabriel and Sting. Yusa released her self-titled debut album in 2002 on Tumi Records. Her music has been describedas a melding of jazz, rock and modern Brazilian music. Joachim Horsley is a composer, pianist, and arranger known for blending great works of classical music with afro-caribbean rhythms which has been viewed millions of times online garnering him international attention. He has also composed the original score for the Disney animated series “Big City Greens,” and the 2018 feature films “2307: Winter’s Dream” and “Guys Reading Poems” (starring Patricia Velasquez). Working with composer Anton Sanko, Horsley orchestrated and conducted the score for the films "Ouija," "The Possession," and "Rabbit Hole" (starring Nicole Kidman and Aaron Eckhart), as well as the TV series "Great Migrations," which aired on the National Geographic Channel and won a News and Documentary Emmy® for music and sound. In addition, Horsley has also worked with artists such as Michael Bublé, John Legend, and Ben Folds.